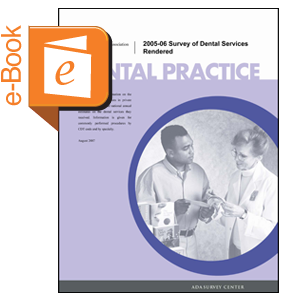 Provides statistical information on the patients treated by dentists in private practice in 2005 and 2006 and national annual estimates on the dental services they received. Information is given for commonly performed procedures by CDT code and by specialty. A greatly expanded number of procedures is included compared to the 1999 report. This is a downloadable report, which is also available free of charge to ADA members at www.ada.org/freereports.